​​​​​​​​​​​​​​Raised gardens are an ideal way to garden at your home. 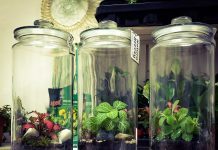 They allow you to easily control the soil and seeds added, as well as organize the plants neatly throughout the garden area. Most raised garden ideas start with a box made of wood boards, galvanized metal, or even wine crates! 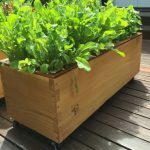 Whether you need a taller garden to be comfortable while planting, ​or you want to protect your vegetables from animals, raised gardens can be just as fun and beautiful as ground-level flower beds. You might even find they’re easier to maintain. Most gardeners start with wooden raised gardens because the supplies are inexpensive and easy to find at a local hardware store. While you can get picky with the wood you choose -- pine, cedar, pressure-treated -- start with what’s easily available to get going. If you’re using 2x4s, Lowe’s suggests a 4-foot by 6-foot bed with 10.5-inch walls. When you’re planning the layout of your garden​​​, ​be sure to leave about two to three feet between beds to make space for pulling a wagon or weed-whacking the walkways. Now that you have all the supplies, you’re ready to build your box! These simple steps will have you planting the same afternoon, so make sure you mark the 4-foot by 6-foot area in your yard and till the dirt to allow for root growth and drainage. The first step is cutting the boards. Many hardware stores will cut the boards for you, but you can do the same with a hand saw, or table saw. Pull out a tape measure and mark the 6-foot length on six of your boards. You should have six 4-foot sections remaining, which can be cut down to the 3-foot 9-inch lengths for the short wall. From the remaining four 2x4x10 boards, you'll cut the ten 10.5-inch supporting posts. Next, assemble each wall of your raised garden box. You do this by stacking three boards, so they are 10.5 inches tall. Then add support posts to the inside edge and along the inside to hold the boards together. After you have done that together, add screws to keep it together. After you have built the box, it is time to add the mesh. To keep weeds out of the garden, staple the mesh across the bottom of the box. The mesh allows worms (who aerate the soil for good water and air flow) to get into the garden! Finally, you will want to protect it with plastic. If your wood is not water-resistant, line the inside of your garden box walls with heavy-duty plastic to protect from the soil and water. 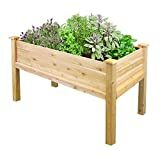 Now you have a simple wooden raised garden to fill with flowers and vegetables. Even though these seem like the easiest, they’re also a favorite of our raised garden ideas because they get you gardening. ​One problem gardeners encounter while growing is plant height. 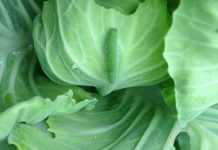 When some plants or flowers grow taller, the low-lying plants like cabbages or lettuces receive less sun. Avoid this with tiered garden beds. Not only does this style allow for varying plant height, but the added dimension also looks great in your yard. 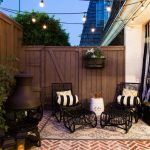 The bloggers behind ChrisLovesJulia.com show in-depth instructions on how to build a tiered planter for their deck, and its sleek design is one of the more minimalist raised garden ideas while maximizing planting space. These can also be simple wood boxes but built to look like stairs with a higher tier in the back, and this style works well for a mix of plants like trailing vines or low shrubs combined with tall flowers. If you love to spend time in the garden even when you're not gardening, consider this fun raised garden idea. By adding a wooden bench surrounded by raised planters, you can relax in the garden with your flowers all around you enjoying. It also adds some privacy to the seating area of your garden. Modular product with reversible surface - choose the grooved or plain face of boards to face outward. Another option is adding a supported bench to the outside of your wooden garden bed, which would allow easier access while working. 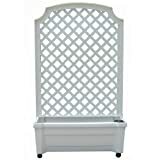 These act as a type of potting bench, but also give you somewhere to sit while you dig and plant in the garden. Maybe you don’t have a large grass yard for gardening. You can still have a garden bed on our deck or cement patio. In fact, adding legs to your planters makes them closer to counter-height and more accessible to maintain instead of kneeling in the garden. If rabbits or moles (or possibly your puppy) continually destroy your garden, lifting the garden off the ground with legs should help solve that problem. Flip the table over and place on a workbench or solid surface. Unroll and use your wire cutters to cut the hardware cloth to size across the bottom of the table. Staple along the edge of the table. You might need an extra set of hands to hold it in place while you're stapling! Measure and cut the cedar lattice to fit around the under edge of the table, covering the edge of the hardware cloth. Using the drill and screws, secure the lattice in place to support the fabric. If you have a large table, you may add a strip across the middle to support the weight of the soil in your garden. Line the tabletop-planter with landscape fabric to keep all the soil in, but still allowing for drainage. Then fill with soil and plant your flowers! When you can’t spread out with your garden, it’s time to go up with trellises. Several raised garden ideas show a wooden planter for the base, then a trellis added of the planter for plants that grow vines. Another option is hanging small containers on the trellis to maximize the space even further. With colorful pots, the display is fun and bright even before the flowers bloom. Just make sure that all the plants receive enough sunlight throughout the day. Trellises work well on a deck as they line up along the wall of your home, and the flowers can act as a decoration for your space. With tomatoes growing up a vegetable ladder, you could have a great garden without changing anything in your backyard. Planters are just the beginning of our raised garden ideas. Once you have the foundation, you can add different elements to the garden that make it a special place, not only for you but guests and family members. With decorative features, you’ll be proud to show off your hard work! Pathways between raised garden beds offer lots of room for inspiration and decoration. If you left two to three feet between the planters, you should have enough room for a lawnmower to maintain grass walkways. Minimizing weeds is always a top concern for gardeners, but it can be challenging in the area around the garden beds (all the weeding focus is inside the beds). Mowing and weed-whacking become very important in this area to keep it looking pretty. Another option is to lay pebbles between the beds. These are beautiful but can be costly and labor-intensive. If you plan on selling your home, a future homeowner might want to revert the area to grass and won't appreciate your efforts. 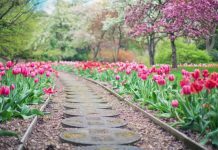 You can also lay pavers with ground-covering vegetation between each step, which would add interest to the garden, as well as keep maintenance easier. While garden gates are primarily to keep destructive animals out of your flowers and vegetables, you can get creative with the entryway into your garden. Walking through an arbor with trailing flowers such as roses or wisteria along the top will make the entrance almost magical for visitors. Hunt around local antique shops during the spring and summer to find a vintage iron gate for the opening to your garden. That works exceptionally well to match the architecture of an old home, or if you want to incorporate an eclectic style into your outdoor space. Last but not least, you will need to protect your new garden from animals. Deer, rabbits, chipmunks, and other burrowing creatures can invade the space if you’re not careful. While most of these raised garden ideas naturally protect from more critters, but it’s always good to include some fencing or mesh. Remember, deer can jump most fences as long as they have enough space to jump back out. You can easily build a tall fence around your garden with wood posts and mesh netting from a hardware store. Using mesh means you’ll still be able to look inside your garden and enjoy from a distance while keeping your vegetables and flowers protected from deer. Now that you have a few raised garden ideas, it's time to get gardening! With protection from animals and better control of the soil, you'll have a little less work to do, and your plants will grow in densely. Your flowers might even brighten the inside of your home and be the topic of many conversations at outdoor parties. Whether you choose to plant herbs, vegetables, or flowers, you'll be proud of the hard work you put into planning and building out the space.